March | 2012 | Beer Apprentice - Craft Beer News, Reviews, Interviews and Info. Hello guys. 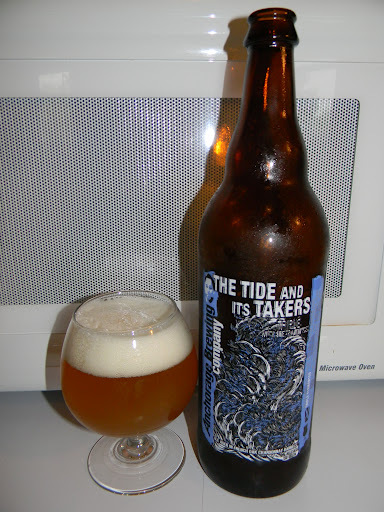 For today’s craft beer review I’m going to be trying The Tide And Its Takers produced by the Anchorage Brewing Company located in Anchorage, Alaska. This beer is Batch #1 and it was bottled in October, 2011, so I’m very lucky to have obtained a bottle this rare. How ’bout it? You ready for a sip? This beer comes in a 25.4 oz. bottle and it has an ABV of 9.0%. It poured a hazy, yellow to orange color with a bright white head that was sized very nicely. It was smooth, soft, fluffy and frothy. The retention time was more than adequate and the lacing was surprisingly good. It was left clinging to the sides of the snifter for a good long while. Once the head finally settled it left a skim of film on top of the liquid for the remainder of the drink. The foam was easily regenerated when swirled vigorously. The aroma was outstanding!!! It started with a strong hint of that “barnyard funk”, however it subsided considerably once allowed to breathe and open up. A relaxed sourness was noted at first, however a sturdy yeast compounded it and balanced everything out. An ample amount of lemon citrus and green apple was made known too. A nice underlying oakiness was found and did nothing but compliment and meld everything together. After a few moments I began to notice that the woodiness really started to take over and define the bouquet. Overall, super well balanced and harmonious. An awesome smelling beer to say the least. The taste was more of the same. More of that funky goodness and sourness at the start that somehow dissipated and smoothed out as the brew warmed to let that spectacular woody/oakiness take over and define the overall flavor profile. However, a compelling sour apple and lemon citrus was made known from the get go. I also noticed a significant peppery spice that was undefined in the smell. One thing of note was that the alcohol was felt more than tasted. The yeasty components were not left behind as they pulled through on the back end to help finalize and balance this incredible tasting beer. The mouthfeel was a solid medium. It was smooth and very dry with a near perfect amount of carbonation. The warmth from the alcohol was ideal. Not too much and not too little. An awesome amount of flavor was left on the palate for me to enjoy for several minutes between sips. Well, it could have just been the mood I was in tonight, but I honestly think that this is one of the best beers that I’ve ever had. The look, feel, aroma and taste were all “world class” in my opinion. I was dreading finishing the bottle. It’s safe to say that I want another. 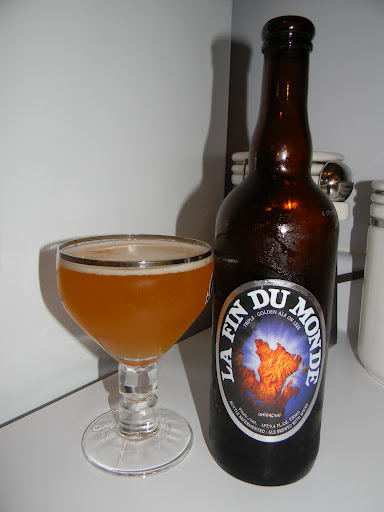 The drinkability was top notch and I have no doubt that it could be enjoyed all year long. The aspect that I liked best was the fact that the oak and wood really became the star of the show. I couldn’t get enough. It was harmonized so well. Obviously, I would recommend trying The Tide And Its Takers, although I’m not sure how easily it could be obtained. If you happen to see a bottle, don’t hesitate at all and pick one up. I think that even the most sophisticated palate could enjoy this beer.